Vinayakrao Patil was born on 1st Sept. 1926 in farmer’s family. His father was farmer but provided atmosphere for education of Vinayakrao and nourishes him very well. Vinayakrao took their primary and secondary education at Bolthan and Nandgaon. He completed his higher education from S. B. College Aurangabad. After completing BSC in 1957 he successfully passed Law examination from university of Pune and became Advocate. Basically he was truth Hunter hence instead of practicing in the field of Law. He accepted the job of teacher in "New Education Society” from 1953 to 1956 he worked as a teacher in Saraswati Bhuwan Shikshan Sanstha Aurangabad. He was interested in social works, so he worked with the department of Prohibition on Wine and education and coorporation. He sacrificed personal luxurious life and devoted himself for public sector. In those days Ordinary people enable to give education to their children. He opened the door of knowledge for poor and illiterate. He shouldered the responsibility of educating the rural and problem facing student. Marathwada Shikshan Prasarak Mandal was founded in 1958 under the able and foresighted leadership of Late Shri.Vinayakrao Pandurang Patil, Ex.Ministor for Co-operation and Ex. President, Maharashtra Pradesh Congress Committee. Late Shri.Vinayakrao Patil, himself was a teacher & was deeply influenced by the social & educational philosophy of Mahatma Phule, Rajarshi Shau Maharaj, B.R.Ambedkar, Karmavir Bhaurao Patil & Y.B.Chavan, architects of modern Maharashtra. He always thinks that enhancing the standard of living by generating human resources and eradicating illiteracy are the key words for rural development. Shivaji College Parbhani, Balbhim College Beed and Deogiri college Aurangabad where initial settlements. In 1968 Vinayakrao Patil Mahavidyalaya started at Vaijapur for rural students. He was equally supported by Late Dadasaheb Sawant, Babasahed Sawanekar, Ramchandra Patil, Baburao Goregaonkar, Baburao Kale, Shripatrao Kadam, Sayajirao Pandit, Dwarkadas Mantri, Dawlatrao Yelikar, Bhanudas Chavan, Bhanudas Vardhave, Sangram Makanikar and Shri Shamrao Kadam, Ramrao Lonikar, Madhukarrao Mule, Ramrao Awargaonkar, Rawsaheb Jambhkar, Hirubhais Jagtap, Mohanrao Kale, Shaikh Ahamad Shaikh Chand etc in his educational work. Vinayakrao Patil was participating in the programs of congress and further he entered in the active politics. Vinayakrao Patil was called as 'Anna'. Anna was elected as President of Marathwada Regional Congress Committee in 1960. He also performed the role of Maharashtra State Congress Committee in 1962. Chief Minister Yashwantrao Chavan influenced by the speech and social work of Anna. Yashwantrao called him, "Vinayakrao is not a Person but a Power". He worked as the Member of Parliament in Upper House in 1960 to 1962. Prime Minister wanted Yashwantrao in Central Cabinet as Defense Minister. Anna spontaneously resigned for Yashwantrao Chavan. This sacrifice of Anna won minds of people. 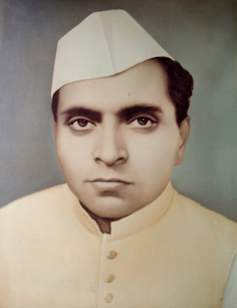 He became Minister for Co-operation in Maharashtra state in 1968. He supported cooperative societies and Sugar factories. He taught people what true co-operation is? He showed the path of Economic Development through Co-operative movement. Anna's Personality was a mixture of cooperation, healthy politics, and quality education and devoted social work. "How Person lived?" is more important than how many years he lives. Time never stops for anyone. Anna leaved this material World on 28 December 1968 at the age of 42.